Lent 4.2 is a new seven-week bulletin insert program for Catholic parishes inspired by Pope Francis's call to care for our common home. 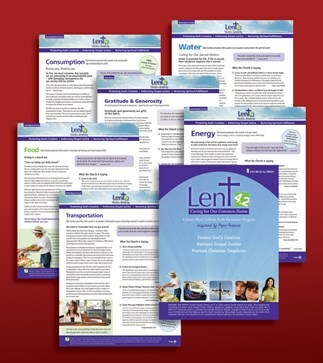 These Lenten inserts are rooted in a spirituality of prayer, fasting, and almsgiving. Each week focuses on the significant issues facing our human family, what the church is saying about them, and how we can take practical steps to make a difference in the world. If the Earth was divided among all of us, each person would receive 4.2 acres. In reality it takes 17.2 acres per person to maintain the average American lifestyle. Lent 4.2: Caring for Our Common Home offers a new way of observing Lent that helps Christian communities follow the call of Pope Francis, walk in the footsteps of Jesus, and live in harmony with God, creation, and the entire human family. The seven themed weekly inserts (for Ash Wednesday and the six Sundays of Lent) come in packs of 50 each, so that one set = seven packs of 50 inserts. Example: A parish that provides 1,000 bulletins per week would want 20 sets (50 x 20 = 1,000). At $42 per set, total cost would be $840 (plus shipping) for seven full weeks of inserts—a complete parish faith formation program for Lent that arrives in one easy shipment! Also available for distribution to parishioners by email, at cost of $1.00 per recipient per set. (Minimum order of 100 recipients please.) Please call 1-800-858-5450 for more information or to order.